Therefore, energy investors in North America are insane. Cheap money (low interest rates) and high oil prices encouraged the drilling of many marginal plays from 2010-2014–causing a huge amount of energy bankruptcies after the oil price crash of 2014. And what did investors learn? Well if you look at what has happened to former highly flyers–Ultra Petroleum (UPL-NYSE) and Halcon Petroleum (HK-NYSE)–not much. Even after bankruptcy, neither investors nor management has learned much. Now, Ultra is a natgas producer, but the principle of a mid-tier US producer going bankrupt and then re-emerging as the same entity on the other side with the same management producing from the same assets at the same prices as before…well I’m not sure that anyone really guessed that back in 2014. Ultra went from $1-$100—and straight back to $1, (old UPL shareholders retained equity in new company) as management mis-timed M&A activity and went for growth at all costs. Their riches-to-rags story is doubly hard to believe when one considers their core Pinedale assets are some of the lowest cost in North America. They had $3.92 billion in debt against assets of $1.28 billion going into bankruptcy. But they were able to raise $2.98 billion in new debt. I’m not sure the Saudis anticipated the Market would quickly re-fund the same energy teams to run the same assets—to the tune of billions of dollars—and keep producing hydrocarbons almost without a hitch. Ultra Petroleum filed for bankruptcy protection in the first quarter of 2016—still producing 732 million cubic feet per day of gas. By Q4 2016, despite its reduced activity levels, was still producing 711 million cubic feet of gas per day. (Source: http://www.ultrapetroleum.com/phoenix.zhtml?c=62256&p=irol-newsArticle&ID=2248155 ) Q1 2017 numbers are not expected until early May. Ultra recently emerged from bankruptcy with a debt load of $2.13 billion, a very generous executive compensation plan (CEO Mike Watford was paid $3 million in 2015 just prior to bankruptcy) and a drilling program that will grow its marginally profitable gas production and likely require additional borrowings. Sounds like more of the same! Though management is only spending $500 million this year on estimated cash flows of $650-$700 million. 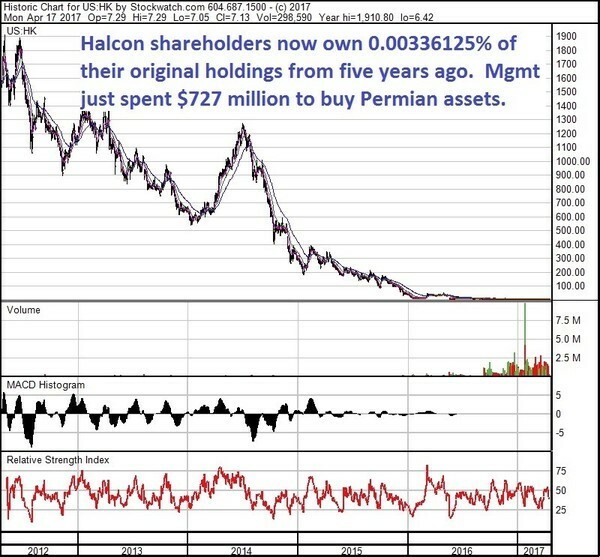 Now look at oil-focused Halcon Resources (NYSE:HK). CEO Floyd Wilson became an American icon for developing the Eagle Ford gas-condensate play in SE Texas, and selling his company, Petrohawk, to BP at the top. But shareholders of HK have felt nothing but pain—in the last five years, shareholders have lost 99.997% of their value. The company has gone through a bankruptcy process after ringing up nearly $3 billion in debt by the end of 2015. They bought assets in every major US play—the Bakken, Utica, Eagle Ford and Tuscaloosa Marine shales among others. They did not get into the Permian—the one US play that can survive $45 oil–until after going bankrupt. And again, in 2016, as they came out of bankruptcy, Wilson received $4 million in salary and bonus as well as nearly $20 million in new stock in the recently reorganized company. And they’re still buying assets—the latest being a $727 million acquisition for 21,495 acres producing 2,801 boe per day of production in the red-hot Delaware Basin on western flank of the Permian. Now to be fair, at just under $34,000/acre, that’s actually cheap if they get results like Resolute Energy. And management is expected to just spend cash flow this year at $315 million, based on 37,000 boepd. However the share price continues to languish near its lows. One could argue that these bankruptcy/re-organizations were happening as costs were dropping like a stone through lower service costs, and better fracking methods (longer laterals/more sand/finer sand)…so on a real time basis, the funders could see their pro-forma cash flows improving literally month by month. But The Big Picture remains the same: the same management–who suffered no financial pain while ruining thousands of shareholders–now running the same assets that drove them to bankruptcy, with continued high debt loads. Einstein was right. We are insane.